Entspannende Hütte am Creek, privat und dennoch bequem in die Stadt! Diese kleine Hütte am Bach ist der perfekte Ort für Ihren Bergurlaub. Wir sind günstig gelegen 25 Minuten nach Downtown Waynesville, 35 Minuten nach Asheville und 1 Stunde nach Gatlinburg. Dieses Haus liegt auf 4 Hektar in der schönen Fines Creek Gemeinschaft mit einem rauschenden Bach, der den ganzen Weg hinunter das Grundstück geht. Setzen Sie sich auf die Veranda, an die Feuerstelle, oder die vielen Plätze auf dem Grundstück entspannen und genießen. Wir haben eine voll ausgestattete Küche mit Betonarbeitsplatten, Küchengeräten aus Edelstahl, Waschbecken aus Gusseisen, lokalen Kaffee und Honig als unser Geschenk für Sie. Wir haben brandneue Memory Foam-Matratzen auf allen Betten. Es gibt einen Fischteich, der nur wenige Schritte entfernt ist, wo Sie spazieren gehen und Ihr Abendessen fangen können (sie verlangen das Pfund), bringen es zurück und werfen es auf den Grill. Es gibt ein großes zweistöckiges Lagerhaus, das perfekt für Kinder und Erwachsene ist. Kommen Sie und genießen Sie die Berge von ihrer besten Seite! Wenn Sie uns zur richtigen Zeit erreichen, können wir Ihnen unser USDA Grass Fed Angus Beef von unserer lokalen Farm anbieten! ** Preise: Bitte beachten Sie, dass es mindestens 2 Nächte gibt. This was my first time using VRBO, I will definitely use again. The cabin was a great getaway. 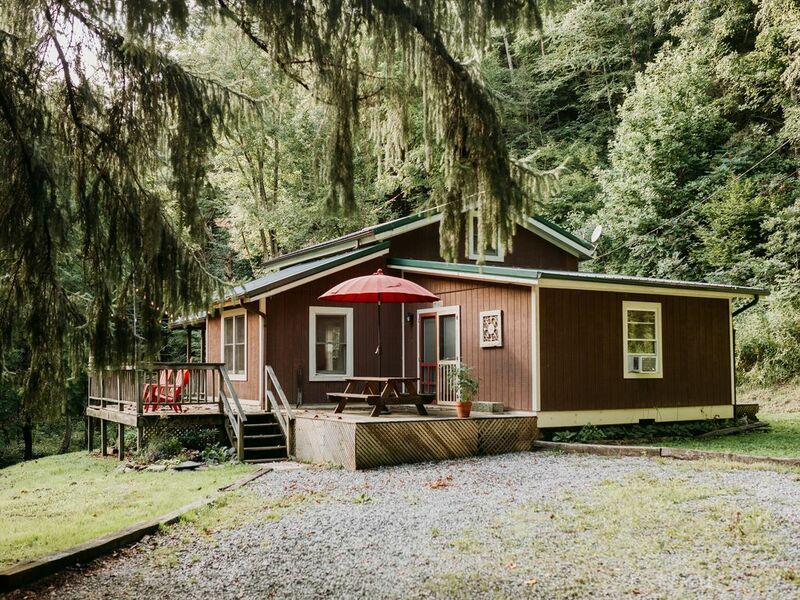 If you’re looking for cozy cottage by the creek, this is it! Enjoyed the sound of the water and the fall colors of the trees were beautiful!. Nice and quiet too. Would definitely stay there again! Great cabin and owner went above and beyond! The cabin was beautiful and perfect! The owner, Amber, went above and beyond and really helped my family out with being able to check-in early so we could get ready for my sister’s wedding in Max Patch. Our plans changed last minute and we had to get ready at a different location then we had originally planned. Amber dropped the keys off early for us to be able to get in and it ended up being the perfect spot for my sister and all of us to get ready. Thank you again and my sister/brother-in-law said they really enjoyed the cabin the rest of the week too. I would highly recommend this place. It is beautifully decorated and the location is perfect. Still convenient to the highway but far enough out to still enjoy the mountains and listening to the creek right outside the house was perfect. Thank you again! Amber was an excellent, thoughtful host, I love all the plants in the home, felt very personal. The entire property is even more beautiful than the photos! The creek is so relaxing! It is about a 20 minute drive to Asheville and there are restaurants and stores in Waynesville, about 10 minutes away. I will definitely be back! The property is beautiful! Perfectly rustic and updated. The owners provided local coffee, soda, and home made canned green beans! My family and I loved fishing in the trout pond for our own dinner. The owners were so helpful and even brought over olive oil and seasoning for our trout. In the morning our car wouldn’t start (vacation nightmare) and they helped us get a new battery and get on our way, all the while with a smile on their faces! Can’t say enough good things about Amber and her Husabnd, we will stay again, perfect mountain getaway! Zentral gelegen für alle Ihre Bedürfnisse!